Lose weight. Get organized. Spend less, save more. Enjoy life. Stay fit and healthy. Those are the top five resolutions made by Americans every New Year. And we mean every New Year! A mere 8% of us manage to achieve our resolutions; indeed, more than half of us stop trying before the year is even half over. Keep it simple. Focus on just a few measurable and attainable goals. Think top three instead of top ten. Keep it specific. Instead of resolving to lose weight or read more, aim to lose 10 pounds or read a book a month. Enlist an ally to help you stay on target. You can motivate and hold each other accountable. 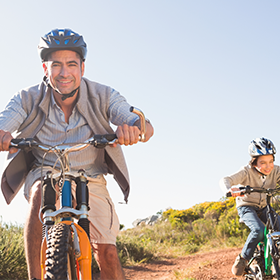 If getting your financial affairs in shape makes your list of resolutions, Entrust can help you give your retirement savings plans a workout. Self-direction is all we do. We provide recordkeeping and reporting for all types of tax-advantaged retirement savings plans: Traditional, Roth, SEP and SIMPLE IRAs, 401(k) plans, HSAs (Health Savings Accounts) and ESAs (Educational Savings Accounts). We will never recommend investments or offer investment advice. We support you with an array of educational resources to help you understand self-direction and the investment options it opens up for you. Our client portal is available 24/7 and we commit to responding to your questions within 24 hours. Our trained, professional staff is only a phone call away, and we have the largest office network of any self-directed administrator if you want to visit us in person. If you want to take more control over your IRA, you can transfer or roll over your existing IRA to an Entrust self-directed account at no cost, until the tax deadline of April 18th, 2017. Once you’ve done that, you can start to diversify the assets in your account away from the typical stocks, bonds and mutual funds offered by banks and brokerage houses. Self-direction allows you to flex your IRA’s muscles by investing in real estate, precious metals, and other alternative investments. If you are ready to learn more about how a self-directed IRA can help you achieve your dream retirement, take advantage of our free Entrust Financial Fitness Workbook to learn wheather an IRA is right for you and how easy it is to get started. Download your free workbook here.